On May 21-June 1, 2018, Dr. Rennae Stowe, assistant professor of Health and Human Performance, and Jemayne King, English instructor, accompanied eight JCSU students, mainly majoring in sport management, to Italy for the summer study abroad program. Yasmine Parker ’20, Zamiyah Ben Israel ’21, Georgina Diaz ’19, Sheila Davis ’19, Maya Lockett ’19, A’Lexus Hardin ’19, Vantino Johnson ’19 and Kennedy Thomas ’21 traveled to Rome, Florence, Milan and Turin. In these major Italian cities, they gained a deeper understanding of Italian culture through sport and hip-hop fashion. Major topics of study included sport and recreation in Italy as forms of social education; examining the social aspects of sneaker culture in Italy; and developing an understanding of the norms, behaviors, and assumptions in Italy regarding the global impact of hip-hop culture. 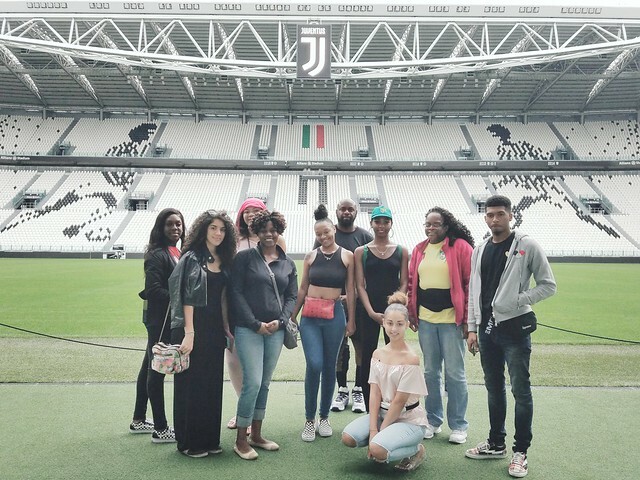 Students toured famous football (soccer) museums and stadiums, trained with professional athletes, visited exclusive galleries and traveled to ancient sites such as the Trevi Fountain and the Colosseum. “Seeing something that was built nearly 2000 years ago was amazing,” one student said. “Nothing could prepare me for the breathtaking and emotional experience I encountered at Vatican City,” said another. The itinerary was a collage of once-in-a-lifetime experiences. The group visited FIGEST (Federation of the Italian Traditional Games) and learned ancient sports from crossbow shooting to bocce and the Ruzzola (cheese) Throw. They also took in soccer training at the AC Milan Junior Camp and had exclusive tours of professional stadiums such as Allianz and San Siro. King, who teaches a popular course on sneaker culture, is a certified football fanatic, so he was as excited as the students to walk among the halls of famed teams. “Milan has two big soccer clubs, AC and InterMilan. We worked out with AC Milan Juniors’ team trainer, doing real soccer drills and conditioning the first half of the day, then went to the San Siro stadium, which hosts both clubs. It was vicious, but fun,” he said. When the Smithites traveled to Turin to see Juventus, one of the top soccer clubs in history, play at the brand new Allianz Stadium, their enthusiasm knew no bounds. Even their driver, who lived an hour outside of Turin, was starstruck enough to go inside and join them on the tour. Overall, King says, they were treated like dignitaries most places they went, and even presented with small gifts. He counted two factors that made it an invaluable experience. “It showed our students we are residents in a global neighborhood without borders or boundaries. Also, and as importantly, it showed our students that Africa’s imprint is all over the world. There’s not a place on earth we don’t influence,” King said. He cited numerous instances of hip-hop styling and culture the students noticed in Italy, from people wearing their sneakers laced over the loop instead of under it—a distinct hip-hop style—to the brands they wore. Maya Lockett ’19, a Los Angeles native majoring in sport management, was surprised at the level of physical fitness in Italy. To prepare for the trip, students had a group project contrasting aspects of Italian and American culture. They researched topics and prepared presentations on the cities they were going to tour. Once there, they kept travel journals, created video blogs of their experiences, and turned in a final essay. Zamiyah Ben-Israel ’21, a biology major from Brooklyn, took the normal steps of preparing for the journey: she bought a European electrical adapter, converted her cash to euros, and researched the weather. She also took the time to look up the ratio of Black people living in Italy. The pro-black young woman said she encountered a few instances of prejudiced attitudes, but overall was surprised at the level of warmth she received from Italians. “I didn’t expect my presence to be so welcomed—or for the gelato to taste so good!” she said. Overall, she recommends the study abroad experience to all her fellow students. “Studying abroad gives you the opportunity to broaden your horizons. You learn new things, see new people and experience their cultures. It challenges your goals,” Ben-Israel said. As toddlers, they could be fined for feeding pigeons in Trafalgar Square in London. The information on this page is maintained by the University Communications and Marketing Department. You can reach them at news@jcsu.edu.